The Inca: a civilization of mythical proportions. Builders of a road system that stretched from Colombia in the north to Santiago de Chile in the south. A people whose great wealth spawned the stories of El Dorado, the lost city of gold. So how could a band of 160 Spanish soldiers of fortune subdue and then crush an empire whose standing army exceeded 100,000 trained warriors? In 1589, the last of the surviving conquerors of Peru wrote this about the Inca and the society they first encountered. “We found these kingdoms in such good order (upon our arrival) and the said Incas governed them in such wise manner that throughout them there was not a thief, nor a vicious man, nor an adultress, nor was a bad woman admitted among them, nor were there immoral people. The men had honest and useful occupations. The lands, forests, mines, pastures, houses and all kinds of products were regulated and distributed in such sort that each one knew his property without any other person seizing it or occupying it, nor were there law suits respecting it…the motive which obliges me to make this statement is the discharge of my conscience, as I find myself guilty. For we have destroyed by our evil example, the people who had such a government as was enjoyed by these natives. Plenty of color maps and illustrations in this informative book—a book which questions many of the common assumptions about the mysterious Inca. Imported from Peru. 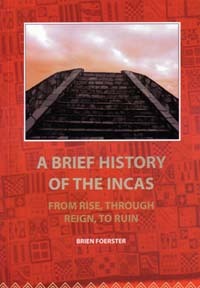 A BRIEF HISTORY OF THE INCAS: From Rise, Through Reign, To Ruin By Brien Foerster. 110 Pages. 6x9 Paperback. Illustrated in Color.